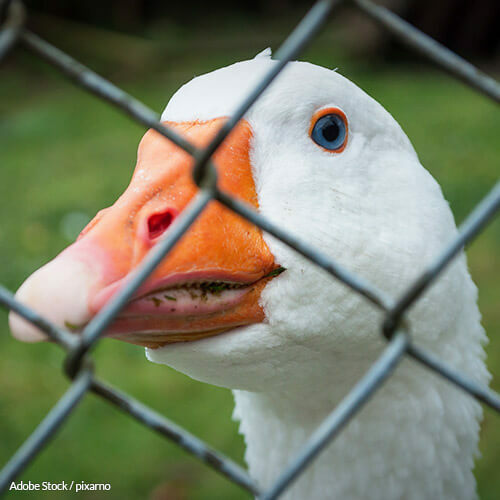 Sign this petition to tell the USDA and the FDA to ban the import and production of foie gras in the United States. Allowing animals to be force fed until they die is a cruel and torturous practice, and needs to stop now. Foie gras production involves ducks or geese being intubated with unsanitary and uncomfortable machinery and force fed the equivalent of 30 boxes of mac and cheese to a 150 pound human  for 2 to 4 weeks. The sheer mass of the corn mush shoved down the birds throats can be enough to rupture the esophagus, cause internal bleeding, and kill the animal. Birds have even exploded from this practice. According to veterinary pathologist Dr. Marianne Heimann, "the liver steatosis caused by 'gavage' is a pathological process that shows itself first by a fatty degeneration of the hepatic cells and then by necrosis. The fatty liver cannot be seen as normal. It is a categorical sign of a state of illness with clinical symptoms ." Yet, foie gras production continues, the goal is a duck or goose with a liver at least 6 times average size, as indicated by an industry standard. Many more are engorged to 10 times  their average size. The span of life for animals forced into foie gras production is short, just as they are filled with torture and abuse. The European Scientific Committee on Animal Health and Animal Welfare maintains that constant handling by humans, damaging and distressing effects oesophagal intubation, and injections of such large volumes of food at one time are each cruel and deadly procedures on their own . But it takes all of that and more in foie gras production. While the U.S. is a major producer of foie gras, it has faced many legal challenges within United States' courts . The current cost of suffering is too great to wait for congressional inspiration. Sign the petition today and ban the import and production of foie gras throughout the United States. Every day, countless ducks and geese are being forcefully fed more than their necks can even handle, some of them left with severe internal bleeding, others with esophagi ruptured, and left dead. The goal is to fatten the birds' livers up to 10 times their average size, ready for foie gras production. The span of life for animals forced into foie gras production is short, and filled with torture. Constant handling by humans, damaging and distressing effects oesophagal intubation, and injections of such large volumes of food at one time are each cruel and deadly procedures on their own. But foie gras production involves all of that, and more. With many other animals, such cruel and unusual treatment would be categorically outlawed, for the sake of health. What force feeding doesn't critically injure animals leaves their livers in a state of necrosis, an abnormal state of illness. There is no reason this practice should be allowed continue in the United States, and to allow it to do so is subsidizing torture worse than any other species of livestock ever faces. I demand you ban the import and sale of foie gras within the United States immediately. That's 51,422 signatures! Let's keep the ball rolling.